This is a fun, challenging game, especially for youth players to improve their dribbling skills. Have half of your players on one side of the grid, and the other half on the side of the grid. - Set up this dribbling skills drill with half of your players spread on one end of a box, and the other half on one side of the box. - Every player needs a ball. - On your call, players in group A + B begin to dribble across to the side opposite to their starting line. - Players must avoid all other players en route to other side. - Players must dribble with their head up, and try to avoid looking down at the ball during dribbling to increase awareness. 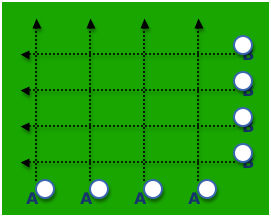 - Players should look for holes/space and use a change of pace to accelerate into those areas. - Players will need to begin very slowly to avoid collisions with other players, but as they get more comfortable the speed can increase. - Players should use all parts of their feet; inside, outside, laces. - Encourage players to not stop while dribbling, rather change direction to the right or left to find space. - Track for points for the quickest player across, deduct a point if a ball is contacted by another player/ball. - Have team A versus team B. As they dribble across they can kick another ball out, but they can only move forward and sideways, not backwards as they dribble. - 5-7 minutes for this Criss cross dribbling skill.